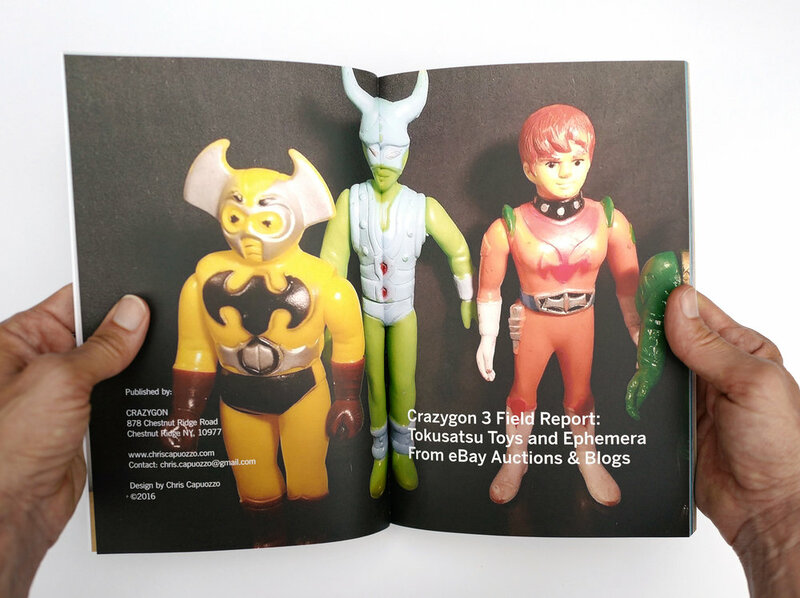 Crazygon is a series of books published by Chris Capuozzo presenting research integral to the production of his artworks, as well as showcasing original work by influential artists who share similar pursuits. At over 100 pages, the current book, Crazygon #3 pays homage to the brilliant world of vintage Japanese Tokusatsu. Tokusatsu refers to film and television that feature fantastical stories, copious special effects and actors wearing rubber monster suits, think the likes of Godzilla, Astro Boy, Ultraman and Kikaider. The sampling offered in Crazygon #3 is culled from Capuozzo's archive of images from eBay auctions and blogs. On an eBay auction page, to best describe an item for sale – a seller will post a suite of images; dust, scratches and all. For Capuozzo, there is beauty in these images; they're loaded with energy that comes from the sort of indifference implicit in their original purpose. For example, detail closeups reveal blasts of color, abstraction and in the case of some of the portrait shots, a degree of pathos; forgotten images of heroes from a bygone era. Some images are cleverly laid out, while others are clumsy and comical--especially comical are images using regular household items as props, such as an old cardboard box used as a backdrop, or a dollar bill used for size comparison. Mimicking the ways that these figures were packaged and sold, Crazygon #3’s special packaging includes labels, header card and a resealable plastic bag. NOTE: As of 8/21/ 17, New orders will take a few weeks to get processed.